Throwing Out the First Pitch - American Presidents On Opening Day - History? Because it's Here! American presidents throwing out that first baseball pitch is a political and historical as well as physical act. History reveals that colonists from England indulged their love of rounders while they relaxed between bouts of founding a new country. Their pioneer games of rounders helped build American baseball tradition and inspire American presidents and passionate baseball fans to pass the baseball tradition bat from generation to generation. According to a 2011 article titled “Mr. Newbery’s Little Pretty Pocket-Book” in Colonial Williamsburg’s Teaching Newsletter, the British have played rounders since Tudor times. Published in 1744, A Little Pretty Pocket Book calls rounders “baseball,” and publisher John Newbery included a rhyme called “baseball, which was the first use of the word baseball in print. In 1762, A Little Pretty Pocket Book was published in Colonial America and the book earned its publisher historical accolades, including the first children’s book. Time and the American Revolution began the transformation of rounders into baseball and its American version. George Washington, later America’s first president, and his men played a form of baseball on the grassy fields of Valley Forge according to Albigence Waldo, a surgeon with George Washington’s troops at Valley Forge. John Adams played what he called bat and ball and Andrew Jackson called his game of ball one old cat. In Baseball and American Culture, Edward J. Rielly wrote that Abraham Lincoln had a baseball field called the “White Lot” built between the South Lawn of the White House and the unfinished Washington Monument which stood only 152 feet tall. People often spied him playing baseball on the White House lawn with his sons and their friends. The Baseball Almanac noted that President Andrew Johnson carried on President Lincoln’s tradition of using the White Lot by placing chairs for his staff along the first base line of the White Lot and giving them time off to view the games. President Ulysses S. Grant hosted the first professional team, the Cincinnati Red Stockings at the White House and President Chester A. Arthur entertained the National League’s Cleveland Forest Citys. In 1892, Benjamin Harrison earned the distinction of being the first President to attend a major league game. He watched the Cincinnati Red Stockings beat the Washington Senators seven to four in eleven innings on June 6, 1892. 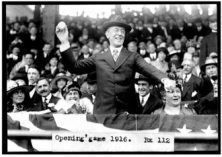 President Woodrow Wilson became the first president to attend a World Series game when he went to the second game of the 1915 World Series and threw out the first pitch. Philadelphia beat Boston 2-1 that day. President Calvin Coolidge was the first President to throw out the first pitch of the first game of the World Series at Washington in 1924. The National Baseball Hall of Fame has a copy of both letters. On September 8, 1945, President Harry Truman attended his first baseball game as president, stating that he wanted his presence to symbolize a return to normalcy after four years of fighting World War II. Altogether he attended sixteen games, the most major league games of any president. President Dwight David Eisenhower attended thirteen baseball games during his two terms in the 1950s. In 1965, President Lyndon Baines Johnson became the first president to attend the dedication of a new stadium when he went to an exhibition baseball game in Houston at the newly finished Astrodome. John Fitzgerald Kennedy attended four baseball games during his short presidency and on April 9, 1962, he threw out the first pitch at the new stadium in Washington D.C. Richard Nixon attended eleven baseball games as president and he accumulated several baseball firsts during his presidency. He attended the first nighttime All-Star Game and threw out the first pitch. He also became the first President to toss an Opening Day pitch outside of Washington. When Gerald Ford assumed the Presidency after Nixon’s resignation, he attended a baseball game between the Texas Rangers and Minnesota Twins on April 9, 1976, and threw out the first two pitches. President Jimmy Carter didn’t throw any Opening Day pitches during his time in office, but he did attend the last game of the 1979 World Series on October 17, 1979. The Pittsburgh Pirates beat the Baltimore Orioles 4-1. Ronald Reagan was the first president to broadcast a play by play game when on September 30, 1988, he broadcast an inning and a half of the game at Wrigley Field between the Chicago Cubs and the Pittsburgh Pirates. He was also the first president to watch a major league game while he sat in the Baltimore Orioles dugout. His successor, President George Herbert Walker Bush went to ten baseball games as president and set a record as the first United States President to attend a game and throw a first pitch in Canada. He traveled to Toronto to watch the Toronto Blue Jays play the Texas Rangers on April 4, 1990. President Bill Clinton attended seven baseball games during his presidency. The first game he attended in April 5, 1993 between the Baltimore Orioles and the Texas Rangers, he threw out the first pitch from the pitcher’s mound and made it to the catcher. George W. Bush served as managing general partner of the Texas Rangers from 1989 to 1994, which made him the first president to be an owner of a major league baseball team. In 2009, President Barack Obama threw the first pitch at the Chicago White Sox opening game and also at the summer 2009 All Star Game in St. Louis, wearing a White Sox jacket and delivering an easy left handed throw. In 2010, President Obama marked the century anniversary of President William Howard Taft’s April 14, 1910 pitch, when he threw out the first pitch at the Washington National’s Park on April 5, 2010. The next 100 years should hold many first pitches and add another chapter to baseball history. Kirsch, George B. Baseball in Blue and Gray: The National Pastime During the Civil War. Princeton University Press, 2003. Millen, Patricia. From Pastime to Passion. Rielly, Edward J. Baseball and American Culture: Across the Diamond. Routledge, 2003.